A Ponoka veterinarian is warning pet owners about porcupine encounters, after seeing a spike in treating quilled-up dogs in recent weeks. Porcupines become more active when springtime rolls around, said Dr. Trevor Hook, owner of Central Veterinary Clinic in Ponoka. So if you spot one when you hit the trails, get your curious pup on a leash quickly. "Some dogs tend to back off right away so they'll get only one or two quills and that'll be it, whereas other dogs, they tend to put on more of a fight response and get more aggressive and actually kill the porcupine," Hook said. "The trouble is, in that process, they obviously take a lot more damage." 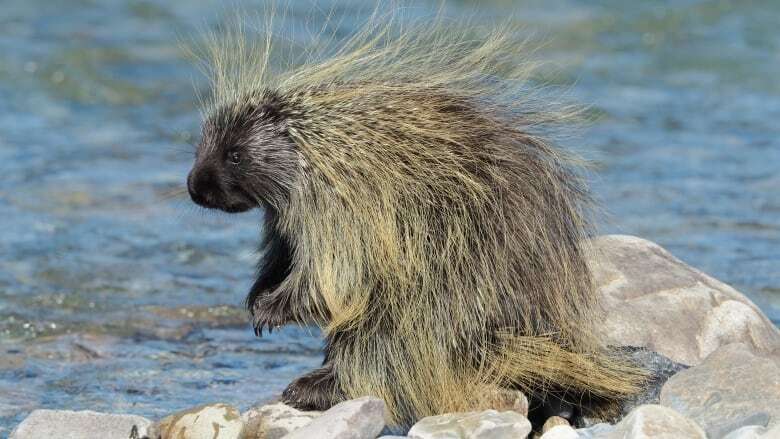 "They can swipe their tail and embed the quills into the dog, but they can't actually throw them," Hook added, debunking a popular porcupine myth. The dog pictured below came across a porcupine in a rural area last year. He was in "rough shape" after his battle with a porcupine. His injuries were substantial, with hundreds of quills in his mouth, throat, cheeks, nose and paws — some narrowly missing his eyeballs. After receiving veterinary care, he's doing well now. 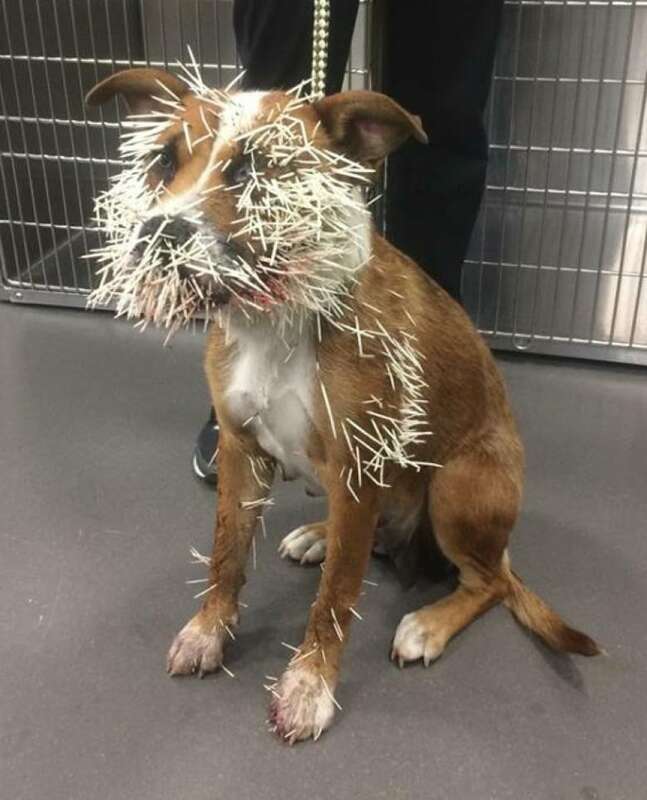 If your dog gets spiked, don't cut the quills off, Hook said. That will lead to many more problems for your pet. "The quills are barbs, so if you cut them off at the skin, they'll continue to migrate in and then they're impossible to get out," he added. If there are one or two quills and the dog's demeanour is calm, you can try to remove them with "extreme caution," Hook said. But generally, consult your vet and leave it to the pros. When you get to your vet, doctors assess the animal, stabilize their cardiovascular condition, and sedate them. "Some dogs, that's enough to get the quills out," Hook said. "On this dog, it wasn't, so we had to induce general anesthesia for short bouts of time. The trouble with these dogs, because they have so many quills in their mouth, you can't intubate them." What vets can't see, like quills that break off and get stuck beneath the skin, can make it tricky to treat affected dogs. Embedded quills can be tough to find and then get out, Hook said. If quills get into the chest, emergency surgery is sometimes necessary to remove them so that further problems like pneumonia can be prevented. Porcupines have poor eyesight and they're not very quick, so they're very susceptible to run-ins with other people and animals, Hook said. Spiky run-ins happen to other curious species like horses, cows, and cats — albeit less often than dogs. It's the time of year to be more aware of porcupines when you're out and about in the bush, Hook said. "They're going to start moving a lot more, for sure."